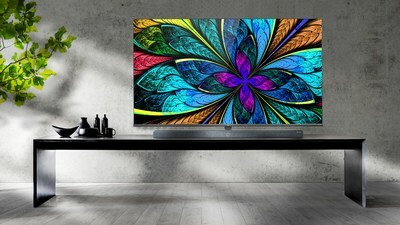 LAS VEGAS, Jan. 7, 2019 /PRNewswire/ — TCL, top three global television brand and leading consumer electronics company, today debuted its latest artificial intelligence (AI)-powered 8K TVs, including the flagship TCL X10 QLED 8K TV and an 8-Series flagship TV, its first QLED 8K TV for the US market, at the International Consumer Electronics Show 2019. The company also officially announced it has joined the 8K Association as a founding member and launched its new branded platform for AI solutions, TCL AI-IN. TCL AI-IN is TCL’s new branded AI platform, under which all of its AI-powered products will be grouped, and successfully integrate its smart technology partners such as Android TV™, Roku (North America only) and Amazon Alexa. With this platform, TCL is building an intelligent ecosystem that provides consumers with a simple, personalized life experience. The flagship QLED 8K TV from 8-Series for the US market will be available in 2019. Detailed specifications of the TV will be disclosed in due course. *Product specifications and sizes differ in different regions. Product availability varies according to local launch plans. Headquartered in China, TCL Electronics Holdings Limited (HKSE: 01070) is one of the top three players in the global TV industry, engaged in the research and development, manufacturing and distribution of consumer electronic products. TCL Electronics is striving to build a comprehensive ecosystem for smart TVs that provides users with a superior experience with its smart products and services. Captain for Masters Security football Club, Champions of the 2018 Carlsberg Cup, Francis Mkonda has won the Cup’s Discovery of the Season Award after dominating polls by sports journalists. Mkonda scooped 20 votes out of the total 25 from the sports journalists and edged out his teammate, Juma Yatina who amassed two votes and Hangover United’s midfielder Richard Rabson who collected three votes for the award. For winning the award, Mkonda went away with a miniature and K200, 000, 00 cash. In a letter from Football Association of Malawi (FAM), Director of Competitions and Communications, Gomezgani Zakazaka said the 20-year-old was instrumental as Masters Security displayed wonderful football when they won the Carlsberg Cup, which was their maiden national cup victory. He won the man of the match accolades in the Carlsberg Cup semis against Nyasa Big Bullets and in the final match against Mighty Be Forward Wanderers, a testimony of his contribution to his team’s success. His performance in the 2018 Carlsberg Cup competition also earned him a place in Under 23 national team, the statement reads in part. Groupe Castel Malawi Ltd Market Category Manager, Twikale Chirwa, sponsors of the Carlsberg Cup for over 10 years now, said they introduced the Discovery of the Season award in 2013 to encourage upcoming players. He said they are impressed with the performance of the young players in the competition, adding that the award is given to a young unknown player who made an impact in the competition. For one to make a name in the Carlsberg Cup and get a national team call up shows the impact the cup is making in exposing young talent and we wish Mkonda a successful career, Chirwa pointed out. Meanwhile, Mkonda said the Carlsberg Cup success was all about hard work, adding that the award will motivate him to work extra hard and improve as a player to win more trophies. It is an honour for me to win this award. It is not easy to get such recognition out of all the players who took part in the competition. I would like to thank my teammates and everybody at the club for contributing to this award, he said. Masters Security Team Manager, Muhammad Selemani expressed delight and thanked FAM and organizers of the cup for recognizing their player with the Carlsberg Cup 2018 Discovery of the Season award. We are very happy as Masters Family because it shows that we are now earning recognition. Voting our player as the Carlsberg Cup Discovery of the Season is not a fluke, he told Malawi News Agency (Mana). Other previous awardees include Kamuzu Barracks Goalkeeper, Lemani Nthala who won the award in 2013, in 2014 it was Francis Mwambo of Zomba United while in 2015 Juma Chikwenga of Moyale Barracks cliched the award. George Chauya of Mangochi Police won the Carlsberg Cup Discovery of the Season award in 2016 and in 2017 it was Tony Biyasi of Nchalo United. Born on October 22, 1998, Mkonda played five games in the Carlsberg Cup and scored one goal. BALAKA (Malawi), Malawi President Peter Mutharika called for a life sentence penalty for those convicted of killing people with albinism by a competent court of law. Mutharika’s call came barely 48 hours after the UN in Malawi urged Malawi government and relevant stakeholders to double their efforts to effect immediate measures to protect persons with albinism. The UN appeal came in the wake of a latest brutal killing of a person with albinism that occurred on the eve of the New Year in the country’s lakeshore district of Nkhata Bay. “I have made a directive that when the suspects are tried and convicted of murder, they should be given a life sentence so that they never come back but rot there in prison,” said Mutharika. The Malawi leader said he still did not understand why at this new time one could believe that body parts of a person with albinism could make one become rich. Persons with albinism in Malawi continue to live in fear of being killed for their body parts despite the fact that in June 2018 Mutharika launched a four-year National Action Plan on Persons with Albinism to end the growing atrocities against them. Four men aged between 19 and 37 have been arrested in connection with the killing of a 54-year-old man with albinism on the eve of the New Year. To date, about 23 brutal killings of people with albinism, including women and children, have been recorded in Malawi since 2013.